Checking requires a different mindset than designing. But if you’re building airplanes or spaceships, you absolutely must check your design thoroughly because the consequences of missing something are simply too dire. Editor’s Note: The following is the second in a series of four articles contributed by industrial designer Ken Sauter on the basics of design engineering. I’ve been designing things for over 40 years, and one of the most expensive problems I’ve ever seen is the lack of serious design checking. Hundreds of thousands of dollars, if not millions, are wasted because of simple, correctable, avoidable mistakes. We all depend on each other to do our jobs, and each of us has a primary job. If you’re being paid to design widgets, you concentrate your energy on knowing about widgets and how to design them. Checking is a separate function that takes time away from designing widgets, and you want to get back to designing widgets. After all, that’s what the company hired you to do. So, you’ll check other people’s work, or your own, as much as you need to, and then get back to designing widgets—which means you’re not doing the best job of checking. The problem with this scenario is that doing checking as a separate, non-primary function creates an inadequate checking function. I made the mistake a few years ago of getting a couple of brackets backward on a tubing assembly, which is very easy to do. Although we had another designer doing the checking, he completely missed the fact that the brackets were backwards. If he had done a proper job of checking, he would have caught the problem. As it was, an entire run of parts had to be scrapped and redone, along with the fixturing. You could blame me for not getting the original design exactly right, but ask yourself: Do you always get the design right the first time, or even the second time? Would you feel comfortable if you were required to get everything right the first time, all the time? I certainly wouldn’t. I am extremely uncomfortable with a boss who expects me to get everything right all the time. I know I’m not perfect, and I don’t know anyone who is. We are all imperfect human beings, and that makes checking necessary. Every design is going to get checked. Ultimately, it will be checked by the customer who buys it and uses it. The problem with that is that the ultimate check can get extremely expensive and generate devastating legal consequences if the design wasn’t done right. Sure, every design will ultimately be checked by the customer, but it could end up destroying your company, or possibly the customer. Or someone could get killed if the design is done wrong. The bridge in Florida that recently collapsed on top of a few cars and killed people is a glaring example of improper checking, or no checking at all. I hope your company is not like the company that let that happen. The way to prevent disasters like that bridge collapse is to thoroughly check your design before it gets built. If you’re building airplanes or spaceships, you absolutely must check your design thoroughly. There is no option to fix anything in space or in the air. The possible consequences of missing something are simply too dire to not check everything thoroughly. For most of the companies I’ve worked for, however, checking just wasn’t considered as a necessary, budgeted function. If we checked anything, it was designers and engineers checking each other. The problem with checking is that it requires a different mindset than designing. I once spent some time doing computer programming. I learned something very basic to programming: It takes a logical, step-by-step thinking process to do programming. It’s the exact opposite of doing creative design work. The computer thinks logically, and you have to think that way to tell it what to do. I had to spend some time mentally changing gears to get into programming mode. Design is more like art than programming. You are being creative and trying to think of new ways to do things, which sometimes involves a non-logical creative process that generates a new way of doing something. Checking is more like programming than artwork or design. You may have designed a very new and creative way of doing something, but for it to work, it has to be producible and meet design requirements. Checking your design against requirements is a logical, step–by-step process that involves a minimum of creativity. It takes a completely different mindset to do checking properly. When engineers or designers check each other, it is very easy to miss things. Your heads have been in the design process for a long time, and it is difficult to step out of that mindset to do a serious job of checking. You are not aware of all the assumptions you’re making. As a result, many things get missed, and your company spends a lot of money ultimately correcting those things. I’ve worked with checkers a few times in my career. I would get a drawing done, then take it to the checker and ask him to check it. They always found things that needed to be corrected—sometimes, significant things. It’s not that I was careless in doing the design; it was just something I missed or didn’t think of. It gave me a good feeling to know that a separate set of trained eyes went over my design to verify that it was done properly. Sometimes, those checkers were able to make me aware of things that I hadn’t considered. And there are all of the little, but important, things that are very easy to miss, that checkers usually catch. When you think of how much money is lost on bad parts and wasted time simply because someone didn’t check the design, you have to wonder if the company is aware of how much it costs them to not seriously check their designs. When a good checker, who does nothing but checking, goes over a design and verifies all of the simple, checkable things that are necessary to a good design, you can be confident that avoidable mistakes are reduced to a minimum. If your company did a cost study of bad parts and wasted time generated from a lack of serious checking, I firmly believe there would be a direct, measurable correlation. I’ve done anecdotal correlations of my own, for instance, when my company spent $400,000 on bad parts and I knew that no one had seriously checked anything. The project manager just decided to buy the parts and build the thing, except for the fact it couldn’t be built because the parts were wrong. A good checker is worth a thousand times his or her weight in gold. If you compared how much money your company spends on avoidable mistakes versus a checker’s salary, and how many avoidable mistakes wouldn’t happen as a result of that checker’s doing their job, I think that at worst, it would be a wash. At best, it could become the next thing to a profit center, and it would certainly raise your company’s profile in the eyes of your employees and customers. And you would spend a minimum of time correcting avoidable mistakes. When you have a serious, separate checking function, controlled by a checker, it consolidates your company’s understanding of specifications, standards, and design guidelines. Everything that governs your design process develops into a centralized, identifiable source of information that is universally applied throughout your design process. When you have numerous designers, they all have somewhat different understandings of standards and specifications. With a centralized checking process, your checker applies those standards the same way every time. Not only that, but your checker will develop a standardized method of checking that covers all of the important design guidelines that govern your design process. Designers can concentrate on designing, knowing that if they miss anything significant, it will most likely be caught and corrected by the checker. The company can also implement company-wide standards and processes, knowing that the checker will apply those things the same way to every design. As your checker and your designers get to know each other, they will become familiar with common mistakes that need to be caught. The quality of your designs will significantly improve as a result. A centralized checking function gives the checker a lot of power in controlling designs and creates a possible contention between checkers and engineers. This is the company’s opportunity to establish design standards that are proven to generate good designs that are producible, manufactured at minimum cost, reflect the company’s desired design philosophy, and meet all required specifications. It is much easier to manage a single checking function than it is to manage multiple designers and engineers. If done right, it will give everyone in your company a deserved confidence in your design process, and your company will be more profitable. There are two kinds of quality: quality of conformance, and quality of design. Quality of conformance is what most of us are familiar with. Are parts made to their specifications? Do they fit together and work as intended? Quality of design, however, is another matter. When the design and its parts are built to specifications, does the design do what it was intended to do? There is no lack of material on quality of conformance. Every QC department deals with it every day. Quality of design is another matter. It has to do with how well the original design requirements meet the purpose of the design. This is where your company’s particular expertise comes into play. For the past few years, I’ve done a lot of work for a company that designs speed ovens. They are very familiar with how to design an oven to cook food quickly and well, and what it takes in sheet metal and electronics to make that happen. I’m the expert when it comes to creating something in sheet metal, and they’re the experts on how that sheet metal needs to be configured to do the job of cooking well and quickly. Your company has its own experts in how things need to be designed to build whatever kind of product your company produces. 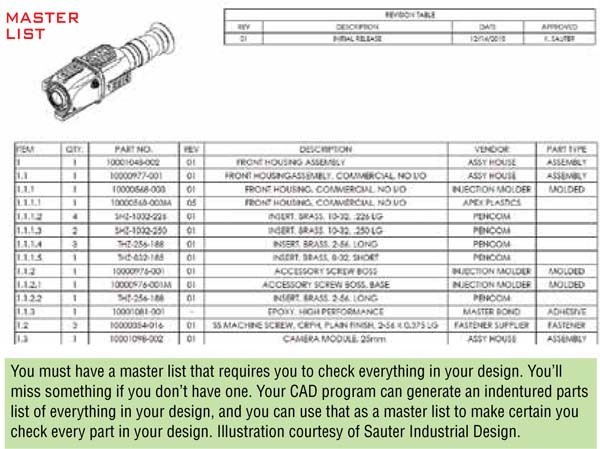 The point of checking is to ensure that those design requirements are properly specified and incorporated into your company’s designs, and to make certain that no avoidable mistakes are made in bringing those designs to production. I say ‘avoidable mistakes’ because they happen so often, are expensive, and yet are easy to correct. And still they happen—a lot. Every company I’ve worked for has a different set of things that need to be checked. I’ve developed numerous check sheets, and they always change depending on who they’re for. Checking is not static, either. The kinds of parts you are checking can generate completely different sets of checks. It may also be important to check the viability of a supplier, not just that the part can be made. If you can’t find a supplier, you’ve got to address that problem. Different suppliers may change the design of your part, which has a ripple effect throughout your design. Your issues are specific to your company, and you need to generate a way of verifying that all the critically important design issues for your product are adequately addressed and checked. Checklists are critically important to checking. They provide a very simple way to verify that all the important criteria for your design are at least addressed in some way. 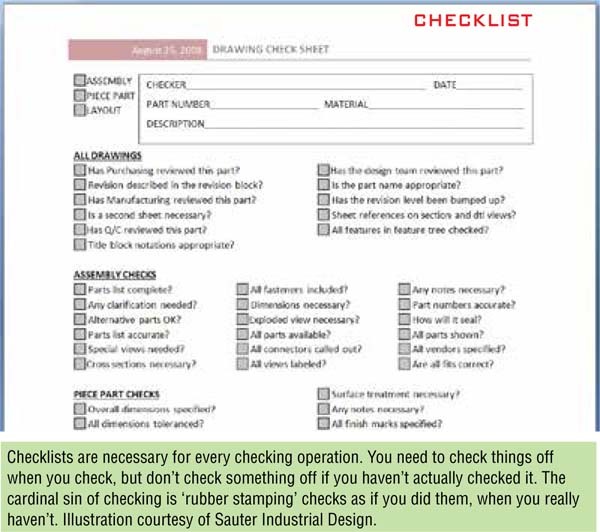 It’s also important to remember that your checklists will change depending on what kind of part you are checking, or what part of the design you are checking. Checking calculations for accuracy is very different from checking that dimensions are all there, and both are important. It may also be important to check that you are doing the correct calculations, not just that you’re doing them correctly. The experts at your company know what needs to be done to generate a good design, and your job is to incorporate their knowledge into a well-specified, thorough checking process that verifies that every critical aspect of a successful design is incorporated into every design your company produces. 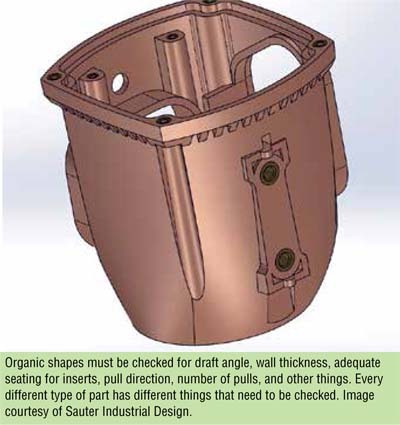 Just because you’re using a 3D CAD program, don’t assume that your design is automatically checked. 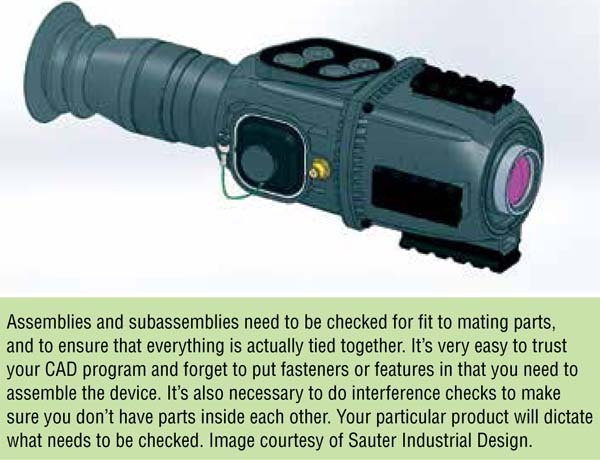 You still have to do interference checks, verify the correct materials, and verify that you can assemble the design. It is quite easy to design something in 3D that can’t be built. And don’t forget that the assembly floor doesn’t have datum planes to assemble things to, as you do. It’s important to build your parts in CAD the same way they’re going to build the parts on the assembly floor. Your datum plane will hold screws in place for you, but the assembly floor doesn’t have your datum plane, and it really doesn’t mean anything to them. Then there is the question of how you incorporate the checking process into your design flow. Do you wait until the design is done, and then check it, or do you check the design at certain critical stages to avoid massive do-overs later? Most companies will check the original design requirements against customer specifications before starting a design. It’s later on in the process that checking becomes critically important to producing a good design. Whether you check your design on the computer or on paper is also a decision you have to make. Another is whether you record the checks you do and identify who did the checks so you can verify later on that they were done, who did them, and how well they were done. There’s nothing like a permanent record to verify that someone did their job properly and keep them accountable. Using digital record keeping, it is possible to keep records of every check that’s done. Not only do you need to check that design requirements are incorporated properly, but it’s also important to check that your CAD models are built properly. I once had to modify a part that another engineer had designed. It was rather large, digitally speaking, so I started analyzing it. I realized that this engineer had gotten 54 features into the part, and then decided he wanted to start over. Rather than start from scratch, he decided to make a cut that obliterated the first 54 features, then went merrily on his way, in the same part, creating it the way he wanted it. Needless to say, I recreated the part from scratch with only the necessary features. I have found it very useful to check my models, feature by feature, to be sure they are built correctly and with no unnecessary features. You will learn a lot about your design when you check it feature by feature. You should have a checker that does this for you. He shouldn’t change your design, but he should let you know when there are better ways to do things and when certain features are unnecessary. You may have to develop a philosophy of part design that everyone agrees to in order to incorporate this kind of checking. If you do, the quality of work generated by your designers will measurably improve. There are lots of things to consider when implementing a checking process. If you incorporate in your checks everything that is critical to what you produce, and have a separate, well-defined checking function to verify that everything is done well, you will greatly improve the quality of your company’s output.